Earlier this year I met a new “cousin”, Elbert Arwine, through the connect feature on Ancestry.com. We started emailing and sharing information. Elbert is not actually my cousin but he is a cousin of some of my cousins. His people and mine were slaves on the same Cleage plantation in Athens, TN. His ancestor changed the family name from Cleage to Arnwine after freedom. He is related to James Cleage who married my grandfather’s sister, Josephine Cleage. While visiting in Athens, TN, Elert met a woman who bought the house of the slave owner, David Cleage. She found some papers that dated back to the 1800’s with names and dates on them. Some of those names were our people. She thought he might be interested and of course he was! She let him make copies which he shared with me. The Agreement I have transcribed and posted here is the oldest document that names names. Named in this document are Bill, Henry, Joe, Frank, Lea, Fannie and Peter. The Frank named here is most likely my great great grandfather and Joe is my almost cousins ancestor. I will write about what happened to Joe and Frank and some of the others after freedom in a later post. I have several bills of sale that I will be posting later also. There are several words I was unable to make out. I left blank spaces there. 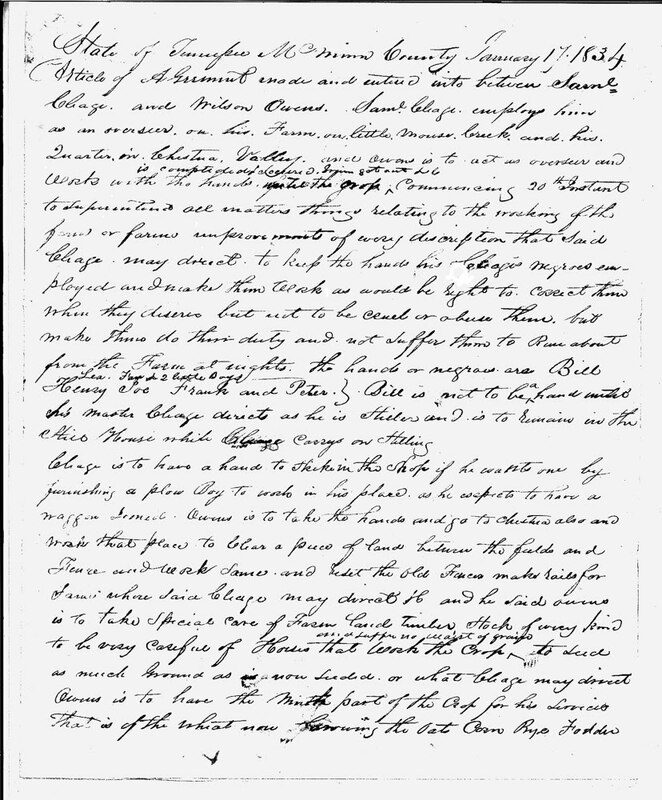 Article of Agreement made and entered into between Samuel Cleage and Wilson Owens. Samuel Cleage employs him as an overseer on his farm on Little Mouse Creek and his quarter in Whisteria Valley and Owens is to act as overseer and work with the hands until the work is completed and ordered. ____________got out/ commencing 20th instant to superintend all matters things relating to the working of the farm or farm improvements of every description that said Cleage may direct to keep the hands his Cleage’s negroes employed and make them work as would be right to correct them when they deserve but not to be cruel or abuse them but make them do their duty and not suffer them to run about from the farm at nights. The hands or negroes are Bill, Henry, Joe, Frank, Lea, Fannie, two little boys and Peter/ Bill is not to be a hand until his master Cleage directs as he is stiller and is to remain in the still house while Cleage carrys on stilling. Cleage is to have a hand to strike in the shop if he wants one by furnishing a plow boy to work in his place as he expects to have a wagon loaned Owens is to take the hands and go to the Westeria also and work that place to clear a piece of land between the fields and fence and work same and reset the old fences makes rails for farm where said Cleage may direct it and the said Owens is to take special care of farm land timber stock of every kind to be very careful of horses that work the crop and suffer no want of grain to feed as much grain as is now need or what Cleage may direct. Owens is to have the ninth part of the crop for his services that is of the wheat now growing the oats corn rye fodder. Cleage is to let Owens have 40 bushels corn for bread at 33 1/3 yards oats 7 bushels oats which said owens is to pay him for out of his share of the crop when said Cleage may want it. The crop to be undisturbed as respects disposing of same by Owens his share until regularly divided, Owens is to furnish wood for stilling have some cut and hauled in due time and also firewood for the use of Cleage what he wants and for himself. Owens is to have his wheat share ground toll free Owens to help have saw hauled while water is now flush to the saw mill for plank improving any thing Cleage may want. Should it be a year that the peaches on said farm should hit said Owens is also to attend to preparing same for tilling and Cleage is to pay Owens what would be right for his actions labour of same. What they could agree upon if they could not agree each one to choose and leave it to a good man what it is worth now the 9th gallon of same Owens to turpentine and have corn for stilling shelled in proper time as Cleage now attends to same with his hands. I can’t begin to imagine how you felt reading that Kristin. What serendipity however that the woman had saved it and offered a copy to Elbert. Better to have it than not, but even so…..
Well, I always knew my ancestors were enslaved and what that meant. And I knew that Frank died free. So I was overjoyed to have something that tied my ancestor, Frank to a time and place. The lack of records before 1866 or 1870 is very real and depressing because you can’t place anybody anywhere for sure, even if you have a family story, unless you find some sort of record. For those lines without a memory of what plantation they came off of I don’t even know where to begin to look. I’m glad that the woman offered Elbert the copies and that we found each other. Elbert’s ancestor changed his name from Cleage to Arnwine after freedom. He and my Aunt Josie’s husband were from the same family. One day I’ll have to do some posts on the white Cleages.